Bloemfontein sometimes seems to be on the way to everywhere in South Africa and its central location and position on main highways makes it a popular, and often necessary, stop for road trippers. Tourists seldom choose to stay in the city for long, but this is more a testament to the other fantastic things to see and do nearby, than a negative judgement on Bloemfontein itself. 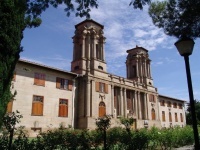 Although it may pale in comparison to cities like Cape Town, Bloemfontein is certainly not without charm and the youthful and proud population are good at making their own fun. If you pass through the city, look out for the lovely gardens, particularly the roses for which the place is named, and the stately old architecture of this judicial hub. 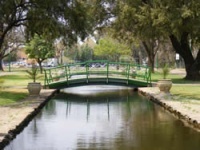 President Brand Street is the best road to stroll down to appreciate the rich history of Bloemfontein, and King's Park is a pleasant place to have a picnic and get some exercise. The top attraction, if you have some time to kill, is the Oliewenhuis Art Gallery, which houses some great South African art in interesting exhibition spaces, including an old underground reservoir which has been converted into a gallery. 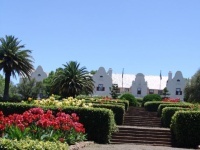 The National Museum and the Anglo Boer War Museum are also rewarding stops. Bloemfontein takes its rugby very seriously and has an exciting local team, the Cheetahs. Sports fans should take in a game at the stadium if possible.